Do you feel like your house has unwanted energies? Do you feel run down, out of energy, agitated, depressed, moody, having intense nightmares and many other things within your house? Do others around you that also live in your house seem very negative and moody? Are your pets more agitated than normal? Some of these very things I myself have experienced first hand and they are not fun. If you wish for help in dealing with or removal of these issues as I have, then this following method may just be what you are looking for? From the first time I took part in this method, I felt changes in my home environment right away and also a sense of more energy within my self. However, I just wish to add that in no way is this ritual a replacement for medical advice and medications relating to the above subjects mentioned. I wish to also add that everything I post here at my blog, I myself work with on an ongoing bases and have found very beneficial. To the point where I have to share with you. so that you also may get these same results. Another thing this following method offers ; and that is protection, it has the ability of closing your aura from not so good outside energies around you. I have always liked the way author Israel Regardie has put it, on explaining our aura. He said that the aura of the human body was much like that of the atmosphere of our earth. I agree, both our physical bodies and the earth are living things that need some looking after or else they will get sick over time, Take for example the earth`s atmosphere, if we do not look after it, then the ozone layer weakens bringing about more damage that is sometimes permanent. With our physical bodies, if we do not look after it in which there are many ways to do this, that I will save for another blog. Then our aura will become a lot weaker, allowing things to penetrate the aura and effect us on many different levels. This is why those that are doing regular spiritual workings should put protection to the fore front of importance. This method below is a simple one once committed to memory. I have also found that in order to clean out the whole house you will have to go from room to room, repeating the same method from the start to finish for each room. The things you will need for this ritual are : One incense stick, matches, magick diary, as you may need to write down some of the words used till you are able to commit it all to memory. The incense used can be white sage, however I prefer to use Frankincense or Myrrh as it drives away negative Entities in a big way though my very own experiences. Some of the words here in this ritual are very powerful, has they are the names of Divine beings spoken in Hebrew. Firstly, go to the South-East corner of your room, after lighting your incense. 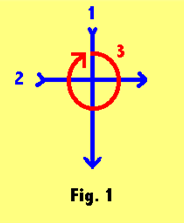 Then make a large cross and circle as seen here in this diagram below with the burning incense stick. Then point the incense stick to the center of the visualized cross and circle as it becomes charged. Now move to the South-West of the room drawing a line with the incense stick. Repeat the same process as done in the South-East corner, drawing the cross and circle with the incense. Move once more to the South-East corner of your room, however this time visualize the cross and circle you made before while pointing the burning incense into the crosses center. Now while in the South-East corner of your room, face diagonally towards the North-West corner of your room. With your burning incense stick in the air move to the center of the room, draw a cross and circle above your head with the burning incense stick. Continue a line from where you are in the center of your room as you move on to the North-West corner of your room. Once in the North-West corner of your room visualize the cross and circle you put there before while pointing the incense to it`s center. Now turn and face the South-East corner of your room, this time holding the incense stick down towards the floor draw a line as you more to the center of the room once more. Draw a cross and circle down near the floor with the incense stick. Continue a line from where you are in the center of the room near the floor while moving to the South-East corner of your room. Visualize the cross and circle you made there once more while pointing the incense stick to it`s center. Then move to the South-West corner of your room and visualize the cross and circle you formed there also, while pointing the incense stick at it`s center. After this, face towards the North-East and move towards the center of the room holding the incense stick high in the air drawing a line. Once at the center of your room draw a cross and circle above your head. After this draw a line high in the air with the burning incense stick as you move to the North-East corner of your room. Once more visualize the cross and circle you made there while pointing the incense stick to it`s center. Now face the South-West corner of your room and move to the center of your room while drawing a line with the burning incense stick down near the floor. Continue on towards the South-West corner of your room drawing a line with the burning incense stick near the floor. Finish up back at the South-West corner of your room. This time draw a much larger cross and circle there. When drawing the circle, start at the bottom and vibrate : Yeh-hah-shu-ah, then when drawing the top part of the circle vibrate : Yeh-hoh-vah-shah. 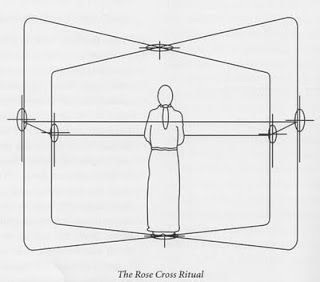 Now go to the center of your room once more facing East, put the incense aside near you, visualize all the network of crosses around you and near you in the center of the room, see them all linked up via an unbroken line formed from the burning incense you used. Visualize a white light forming above your head, glowing and growing stronger and stronger. Feel it over flowing into your body, right down to your toes, till your whole body feels full of energy once more. Let The Divine Light Descend ! Continue with this visualization for two to three minutes or till when you feel filled with the light and charged with energy once more. Notes : If you do not feel comfortable with the names, Osiris, Isis, Apophis and so on which is Egyptian. You can change it for example Virgo, Miryam (Mary), Mighty Mother - Yeshua (Jesus), Slain and Risen - Scorpio, Set or Satan, The Destroyer or which ever substitute name you feel comfortable in concordance with your own personal religious believe system. One thing I wish you to remember which they do not often say in books, is that the names used are not set in concrete and can be changed to fit in with your religion. However I would advise that the names picked are the equivalent to the ones in which I have mentioned in the ritual above. The only names I advise you not to change regardless of religion are the Hebrew God names of power. Hebrew is a very ancient language just like Latin and Enochian and therefore is very powerful and one of the languages that they the Angelic Entities themselves use. The God names are Divine God names belonging to the Divine beings, on choosing something else, the ritual may not have an as powerful effect or worse may be in error and increase your problems rather than fix them. So I hope you find this ritual as helpful as I myself have found it to be. Please feel free to let me know what you think of it or if you have any questions in regards to this ritual above and I will try and help you if I can.